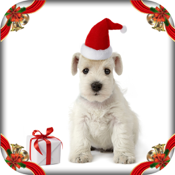 Instantly turn boring photos into beautiful, fun, creative Christmas Holiday masterpieces. Add beautifully designed custom Christmas-themed photo corners to photos you shoot or pull from you Facebook, Instagram, Flickr or photo library. Then email or share your creations with friends and relatives on Twitter, Facebook, Instagram, Flickr and more. Dazzle your friends at how creative you have become. EXTRA FREE BONUS: All Corner My Photos apps include complete, easy-to-use photo editing (just like what's used Flickr and Instagram. It allows you to adjust, edit, sharpen, add stickers, hats, text, captions, even whiten teeth and remove moles. Imagine the unlimited combinations you'll be able to create and share with friends. - Includes both FULL SCREEN resolution for all iPhone and iPad versions. - Use editor only or corners only or both. - FREE SUPPORT (This app is so simple, you probably won't need any support, but if you do, we'll help). * Supports full/native display on iPhone 5, iPhone 5s, iPhone 5c, iPhone 6, iPhone 6 Plus, iPad Mini, iPad, iPad Air, iPod Touch. 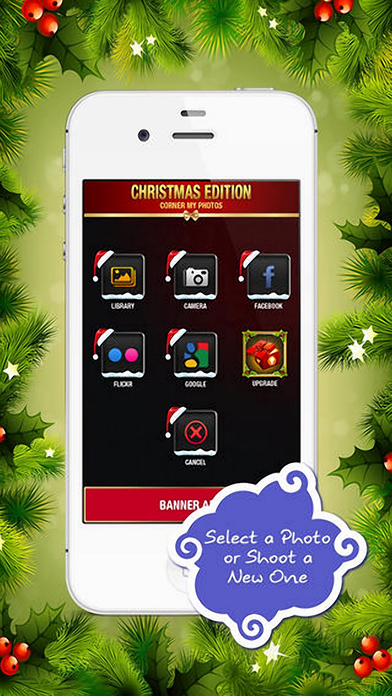 * Beautifully designed app for adding artistically created photo corners to all your pictures! * The only app for adding photo corners, stickers and effects, PLUS editing and sharing with friends and relatives, all in one app! * NOW iOS7 ready too! * 20 beautiful professionally designed custom photo corners to enhance any pic you shoot, or you can also use photos from your photo library, Facebook, Flickr, etc. * Add effects - brighten, colorize, sharpen, remove blemishes, whiten teeth. * Add stickers, hats, mustaches, markers, text, thought bubbles, and more. * Unbelievable combinations using any or all the features. * Use EDITOR ONLY (like Instagram) or CORNERS ONLY or BOTH. It's all up to you and your creativity. * Share with friends on Twitter, Facebook, Instagram, Flickr and more or via eMail. + All the features in the free version. Corner My Photos - Classic Edition - Turn your photos into classics to bring back old time memories of loved ones. Corner My Photos - Travel Edition - Turn ordinary photos into exciting travel-themed memories of your trips. Corner My Photos - Love & Romance Edition - Turn regular photos into loving, caring, romantic memories of special people. Corner My Photos - Valentines Edition - Turn photos into special Valentines gifts for all the loved ones in your life. 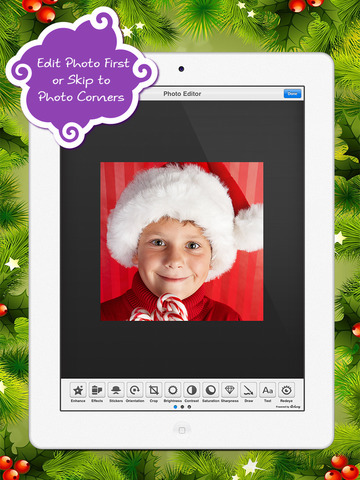 Corner My Photos - Christmas Edition - Turn ordinary photos into magical Christmas card memories. NOTE: This app will auto-detect device type when installed on an iPhone, iPod Touch, or iPad. If installed on an iPad, it provides beautiful full-screen resolution! 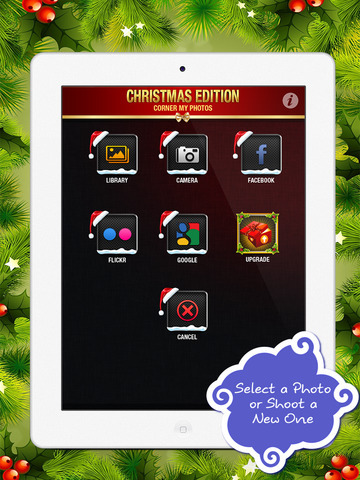 Corner My Photos - Christmas Edition is the best photo app for adding holiday-themed photo corners, stickers and effects, as well as editing and sharing with friends and relatives all in one app!